I – What Is Black And White Pepper? Pepper has been known as an amazing spice for over 4,000 years. Black, white, red and cayenne peppers are common spices added to different cuisines such as cottage cheese, salads, steaks, eggs and other delicious dishes. Because of its strong flavor, ground and whole peppers are used in certain cooking recipes. 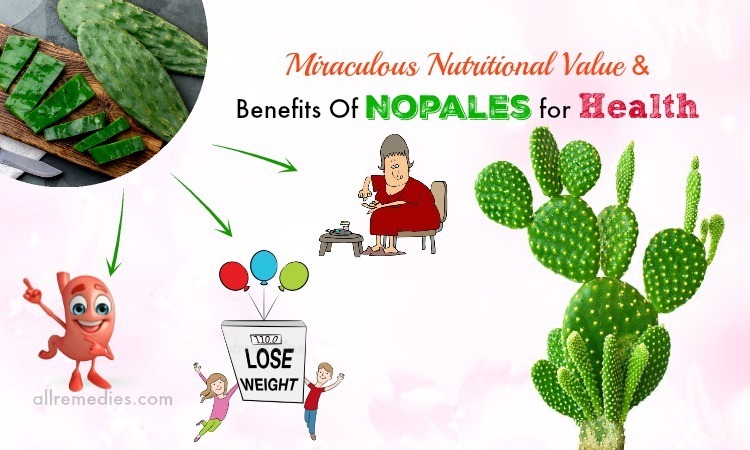 However, the pepper has not only a strong flavor but also numerous health benefits and uses. 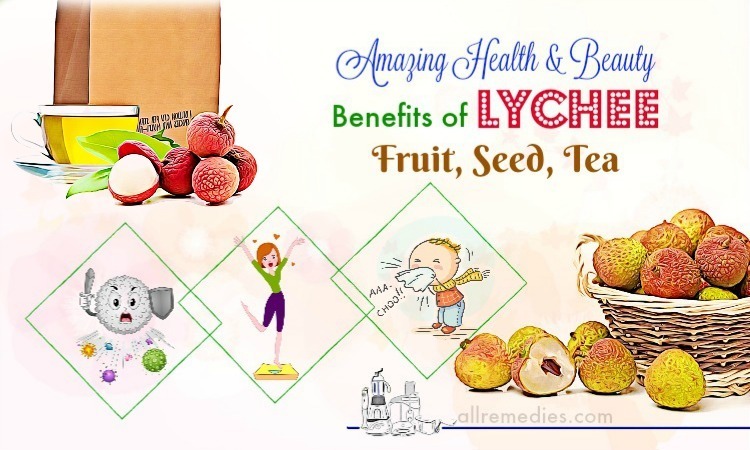 In this article on Allremedies.com, I would like to introduce a number of amazing black and white pepper health benefits. Both black and white peppercorns belong to the pepper plant. But the difference between them is their procession. As a result, their color and taste differ. When the peppers are almost ripe, they are placed under the sun until they are dried and the outer layer turns black. It is a reason why they are called black pepper. The white pepper is produced by picking the ripe peppers and then removing the outer layers to leave the inner seed. Compared with black pepper, white pepper is hotter but less complex. Moreover, black pepper has more flavor than white pepper. Black peppers are used as a common spice in many American cuisines while adding white peppers to light-colored dishes such as mashed potatoes and white sauces are originated in French culinary. However, white peppers are also used in some different cuisines such as Chinese cooking, Vietnamese pork dishes and soups, and some Swedish preparations. Thanks to its strong and unique flavor, black and white peppers are a common hot spice in different cuisines. This spice also owns a number of health benefits. For examples, it contains medicinal effects. The characteristic taste of black pepper is due to its piperine that is an active compound in black pepper. Moreover, black pepper is a great source of potassium, iron, magnesium, calcium, zinc, manganese, chromium, vitamin C and A, and other nutrients. White pepper contains capsaicin that contributes to different culinary and medicinal white pepper benefits. 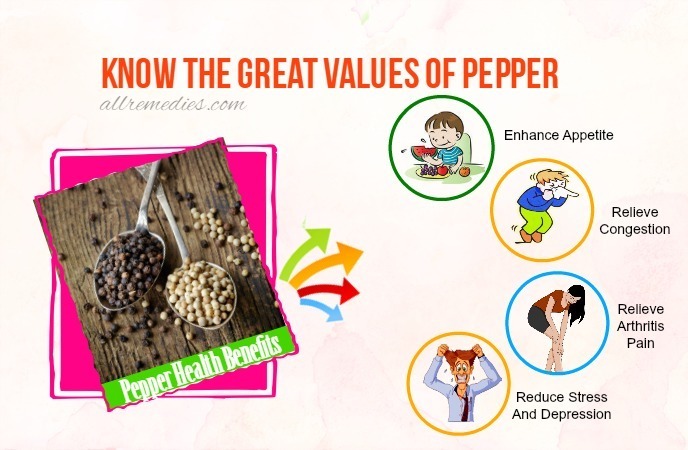 These pepper health benefits are researched and proved in the medical world. Want to know black pepper health benefits, right? Continue reading to know more. The active compound called piperine in black pepper has the ability to boost the absorption of various essential nutrients such as selenium, vitamin C, and A, and beta-carotene. The great absorption of nutrients plays the important role in protecting the body health and preventing diseases. Black pepper is also combined with turmeric in different cooking recipes because it boosts the absorption of the compound curcumin found in turmeric. Curcumin is effective in fighting against infection, cancer, and inflammation. Not all beneficial substances in foods are absorbed and used in body cells. There is the removal of substances from cells because of some certain enzymes. Piperine can inhibit those enzymes and prevent the removal of nutritional compounds. Piperine in black pepper helps to keep nutritional compounds in active and available form. Both white and black peppers have a strong flavor. Therefore, talking about black pepper health benefits, we should mention black pepper as an amazing appetite stimulant. Because of its olfactory stimulation, adding black peppers to different recipes can improve the appetite. Therefore, black pepper is a great home remedy for the loss of appetite. You can add pepper in a variety of dishes. Alternatively, you can use black pepper to make a wonderful remedy for the poor appetite. Like black pepper, white pepper can stimulate your appetite. Black pepper not only stimulates the appetite but also improves digestion. It is one of black pepper health benefits. Consumption of black pepper can increase the release of hydrochloric acid in the stomach. 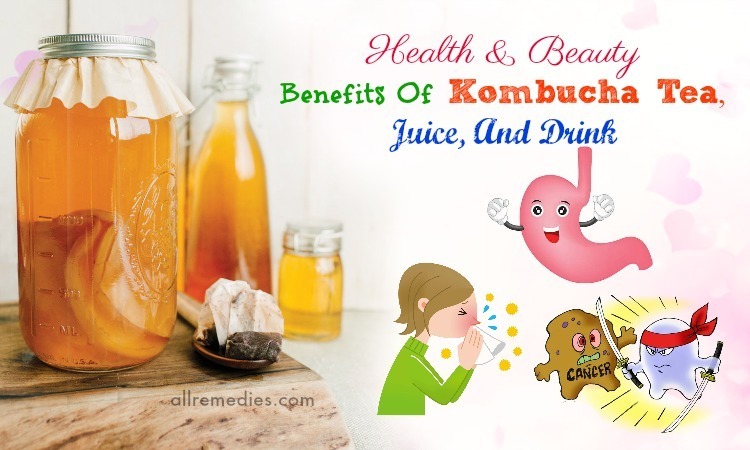 Hydrochloric acid plays the important role in ensuring the proper digestion. A lack of hydrochloric acid may lead to digestive problems such as bloating, colic, flatulence, indigestion and constipation. Furthermore, black pepper contains antibacterial properties that can fight bacterial intestinal diseases. White pepper contains carminative properties; therefore, white pepper can prevent gas formation in the intestines. Consumption of white pepper also boosts the secretion hydrochloric acid that is necessary for digestion. To protect your digestion health, you should add peppers to your diet. Although black pepper enhances appetite, it is included in a list of amazing foods for weight loss. Weight loss is one of amazing black pepper health benefits. This is because phytonutrients in the outer layer of black peppercorns can break down the fat cells. White pepper does not have the phytonutrients because the outer layer is removed to produce white pepper. 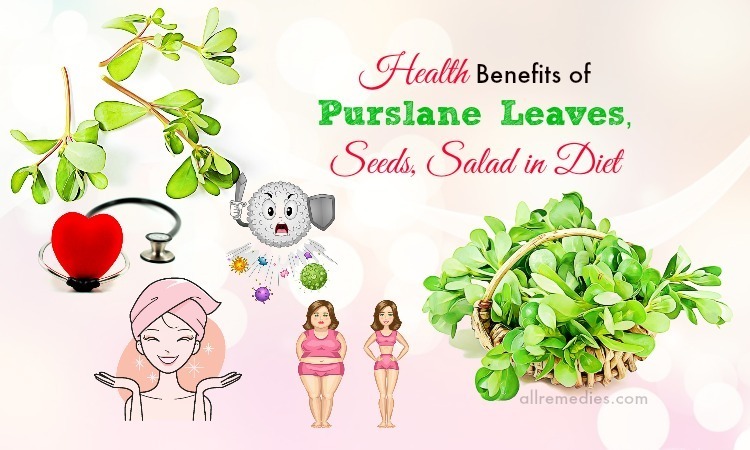 However, the weight loss benefit is due to not only the phytonutrients in the outer layer but also piperine. 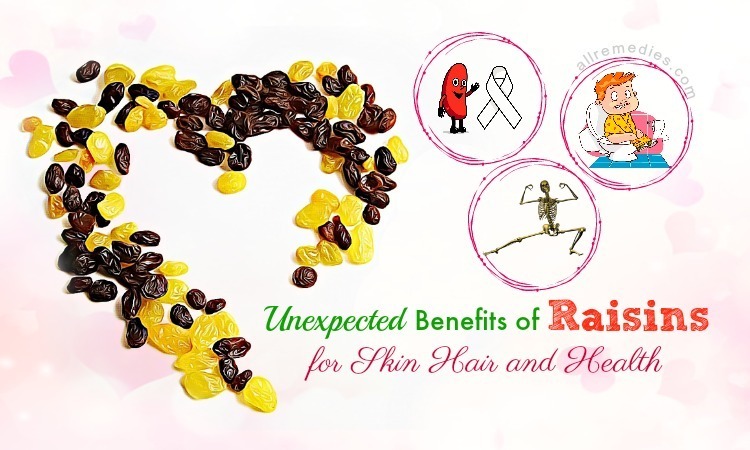 Piperine is effective in preventing fat accumulation in the body. Furthermore, the use of black pepper also helps burn extra calories and lose weight by accelerating your metabolism. In addition, consumption of black pepper can help perspiration and urination because pepper contains diaphoretic and diuretic properties. 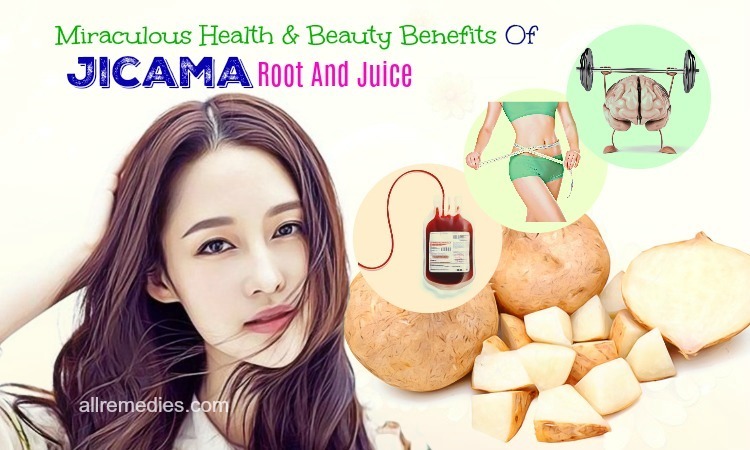 It helps remove toxins and unwanted water from your body. Weight loss is also included in a list of white pepper health benefits. This is because white pepper has the same properties as black pepper for burning fat and losing weight. Capsaicin in white pepper also contributes to weight loss. Black pepper is an effective home remedy for congestion and a stuffy nose. The use of black pepper can loosen phlegm. The antimicrobial properties of black pepper make it become one of the natural remedies for a cold and cough. Here are ways on how to use black pepper for relieving congestion. You can use steam inhalation by putting some eucalyptus oil and black pepper into a pot of hot water. Lean over and cover your head with a large towel. You should do this treatment daily until you get a complete relief. Having the same properties and ingredients as black pepper, white pepper is also used to drain nasal congestion. When you consume white pepper, the heat regenerated treats nasal congestion. Moreover, because of anti-inflammatory properties, consumption of white pepper can clear the airways and fight infection and nasal congestion. Black pepper contains carminative properties; therefore, the use of black pepper can relieve stomach gas. This is because consumption of black pepper boosts the production of hydrochloric acid, gastric juices, and saliva. 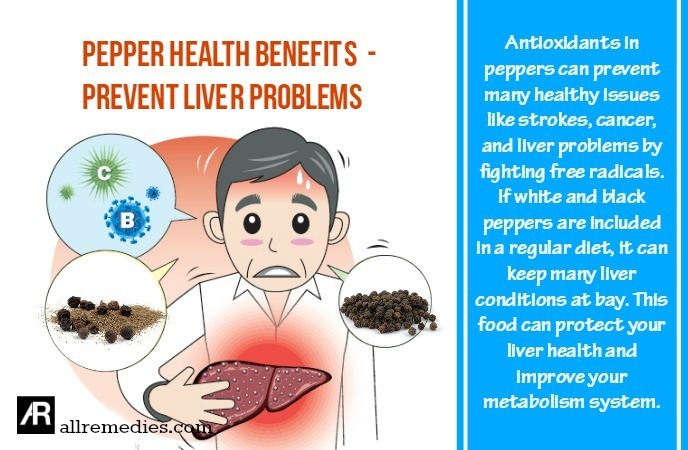 In this article about pepper health benefits, I would like to introduce to you amazing natural treatments for stomach gas using black pepper. If you are vulnerable to stomach gas, it is recommended eating spicy foods with black pepper on a regular basis. Massaging your belly with the mixture of carrier oil and black pepper oil gives you a significant relief from acidity & gas pain. Black pepper should be included in your diet because it can reduce the risk of cancer, including breast and colon cancer. It is due to the antioxidant properties of black pepper. Because black pepper contains significant anti-proliferative effects, it can prevent colon cell proliferation. Some studies found out the close relationship between capsaicin in white pepper and cancer prevention. Particularly, capsaicin in white pepper has the ability to kill the cancer cells. White pepper is often used to prevent the development of prostate cancer. That is a reason why people who often eat spicy foods in their diet are less likely to get diagnosed with cancer. Patients with high blood pressure should consume black pepper and eat spicy foods. The active ingredients such as piperine in black pepper are effective in relieving hypertension. White pepper can control blood pressure too. Nutrients in white pepper such as vitamin C, flavonoids, and vitamin A that can keep blood pressure under the control. Therefore, we cannot ignore that when talking about the pepper health benefits. However, if you are hypertensive, you need not only consume black and white pepper but also have lifestyle modifications. A healthy diet, weight loss, and regular exercise help reduce high blood pressure and prevent its complications such as cardiovascular disease and diabetes. Black pepper should be added to a diet for arthritis patients. The piperine found in black pepper contains anti-arthritic and anti-inflammatory properties; therefore, black pepper is considered as an effective home remedy for arthritis pain. The joint pain is due to poor circulation. Regular consumption of black pepper helps improve blood circulation, thereby relieving joint pain. Black pepper is effective in reducing joint pain and treating other arthritis symptoms, which is included in a list of black pepper health benefits. While piperine in black pepper helps relieve arthritis, white pepper has capsaicin that is effective in soothing arthritis pain too. Capsaicin contains anti-inflammatory properties. Therefore, white pepper is also used to treat muscle pain and swelling. If you suffer from joint pain, muscle swelling and arthritis, you just need to add white pepper in your diet. That is one of white pepper health benefits I would like to introduce to you in this article. Black pepper can be considered as a wonderful natural antidepressant. Therefore, consuming black pepper helps reduce stress and depression. The neurotransmitter serotonin is effective in regulating mood and keeping mind calm. Many studies found out the close relationship between poor production of serotonin and depression. Fortunately, piperine in black pepper is effective in boosting the production of serotonin. Furthermore, consumption of black pepper can boost mental clarity and increase beta-endorphins in the brain because of piperine. Endorphins play the important role in elevating mood and relieving pain. If you are prone to melancholy and anxiety, you should add black pepper in your diet. Black pepper not only lifts your mood but also improves the cognitive functioning. You cannot skip those black pepper black health benefits. The active ingredients present in black pepper have the ability to stimulate the brain’s neurotransmitters; therefore, black pepper not only lifts your mood but also improve mental state. Piperine ensures the brain functions properly when the brain absorbs this active ingredient of black pepper. Regular consumption of black pepper can prevent stroke, Parkinson’s disease, and Alzheimer’s disease. However, further scientific research and studies are needed to prove the promising black pepper health benefits in boosting brain function. Because of the anti-inflammation and pain-relieving properties of black pepper, black pepper is often combined with salt to create an effective natural remedy for gum inflammation, bleeding gums, and bad breath. 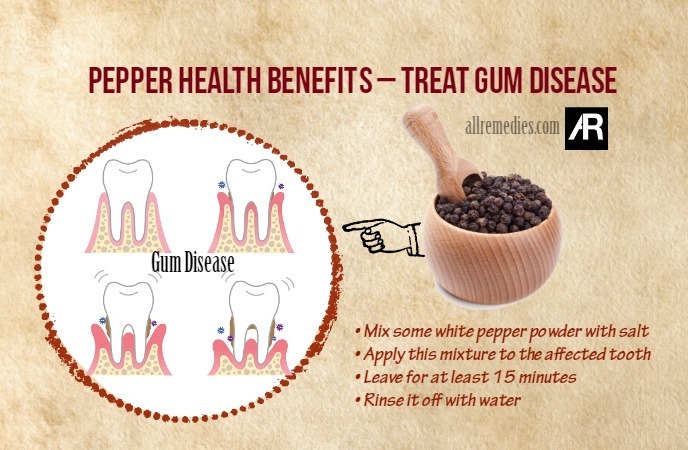 In this article about white and black pepper health benefits, I would like to introduce to you effective ways on how to use black pepper for treating gum inflammation, bleeding gums, and bad breath. To reduce a toothache, you can mix some clove oil with a pinch of black pepper powder and then apply it to the affected area. Leave it for 15 minutes before rinsing your mouth with water. 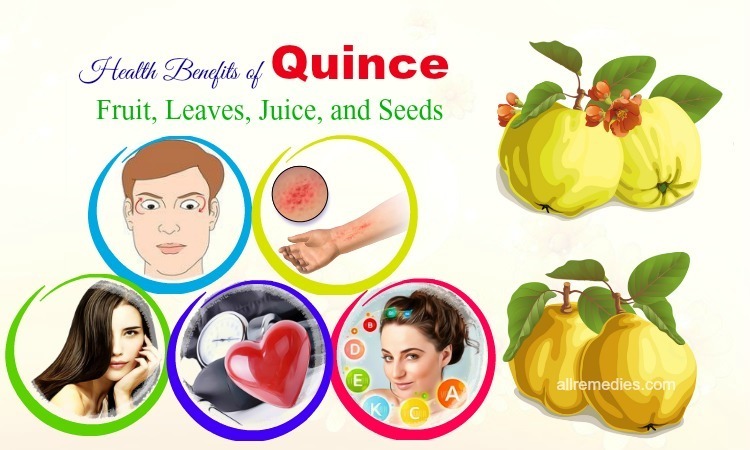 It is recommended repeating this treatment daily to get a satisfactory result. Black pepper is effective in treating a cold and flu because it contains antibacterial properties. A cold and flu are caused by a virus, bacteria, and pollution. A cold and flu may result in chest congestion. As I mentioned before, black pepper is an effective home remedy for chest congestion. Because black pepper is a rich source of vitamin C, regular eating can boost your immune system and fasten the healing process. Black pepper also has amazing benefits for the skin. Black pepper can be a great exfoliator that can help remove dead skin cells and blackheads logged in your skin pores. However, when you use black pepper to improve your skin condition, do not apply it directly to your skin. This is because it can cause skin allergy and irritation. It is recommended mixing black pepper with a little bit of honey or curd. Alternatively, you can add some black pepper powder to your favorite cream. It is important for you to test it on a small area before applying it to the larger sensitive skin. When applying black pepper treatment to your skin, you should massage it for a few minutes to improve your blood circulation. 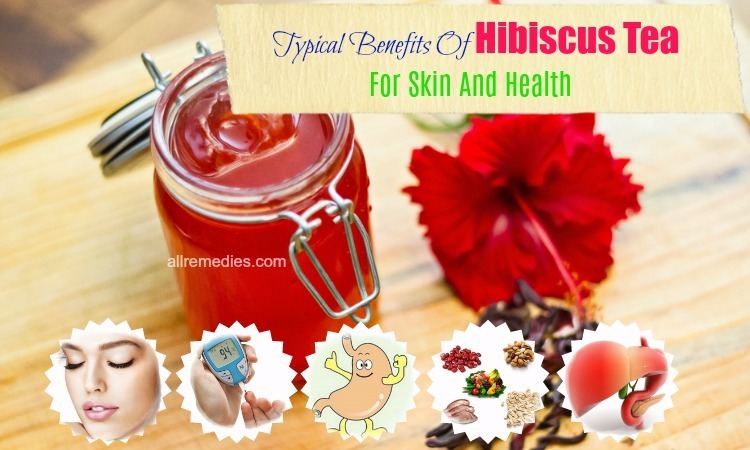 Good blood flow and circulation contribute to the rosy skin. Furthermore, adding black pepper to different foods can help prevent the appearance of unwanted wrinkles. Black pepper is also one of amazing home remedies for Vitiligo and skin pigmentation. One of white pepper health benefits is curing headaches. Neuropeptides cause headaches by transmitting the pain to your brain. Capsaicin present in white pepper is effective in inhibiting the pain transmission to the brain and relieving the symptoms of headaches. To prevent and treat headaches, you just need to add white pepper to different foods. Talking about white pepper health benefits, we should mention this spice as an amazing remedy for coughs. The spicy taste of white pepper is effective in reducing headaches. The combination of white pepper and honey may bring antibiotic effects. The use of white pepper and honey can give you a significant relief from discomfort by generating heat. Both white and black pepper is effective in treating and preventing ulcers. In the article about pepper health benefits, we cannot ignore that. Active ingredients of white and black pepper help kill the bacteria causing ulcers in the intestines and stomach. Moreover, white pepper is an amazing remedy for stomach ailments, including stomach ache. Water retention in the body may result in many unwanted health problems. It deteriorates the function and ability of your heart. Moreover, it causes the excessive pressure in your lungs, thereby leading to difficulty in breathing. When you eat white and black peppers as well as spicy foods, your body may sweat a lot. Black and white pepper consumption can improve your living condition and overall health by reducing excess fluid and water in your body. Talking about black and white pepper health benefits, you cannot ignore the effects of antioxidants rich in peppers. These peppers are great sources of vitamins and flavonoids that contain antioxidant properties. Therefore, consumption of pepper can help your body fight against organisms. Thanks to those great antioxidants, peppers are effective in reducing wrinkles, fine lines, and dark spots that are aging signs. Antioxidants in peppers can prevent many healthy issues like strokes, cancer, and liver problems by fighting free radicals. If white and black peppers are included in a regular diet, it can keep many liver conditions at bay. This food can protect your liver health and improve your metabolism system. The elder people are prone to ear problems due to the aging process. Fortunately, a healthy diet and good lifestyle can keep ear problems and earaches at bay. In a healthy diet, you should eat a variety of recommended foods including white and black peppers. Preventing earaches or ear problems is one of white and black pepper health benefits. It is due to many antioxidants present in both black and white pepper. If you or your kids get mosquito or other insect bites, peppers are effective remedies. Bothe white and black peppers contain anti-inflammatory properties; therefore, the use of these peppers can relieve swelling and inflammation caused by insect bites. 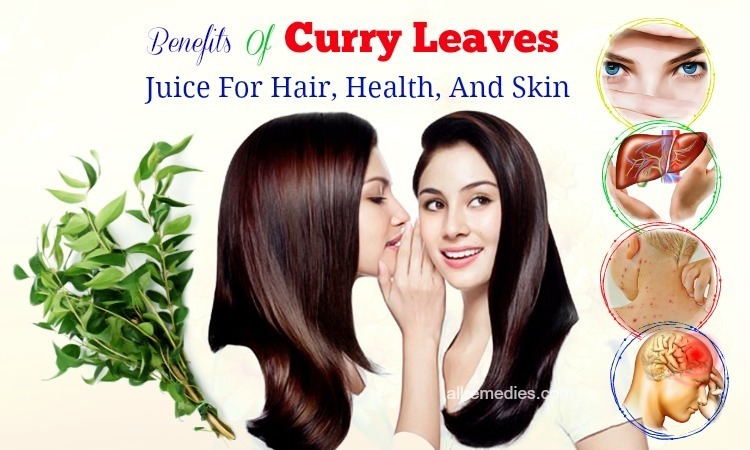 Doing this treatment several times daily can give you a satisfactory result. Stopping bleeding is also one of pepper health benefits. Black pepper should be added to your first aid kit. Black pepper can be used to halt the bleeding. This spice is an effective remedy for abrasions or cuts when you trip over things or bump into objects. It is an alternative safe method when you cannot find medical creams or solutions in the first aid kit. Black pepper does not hurt or cause stinging on your skin. However, using black pepper for bleeding is based on personal experience and it is not a proved method. It has not been researched in a medical field. If you have any allergy reaction, stop doing this treatment and rinse the affected area with water. Find a safer alternative method. Moreover, you should not use black pepper over the area applied a prescribed medication. Never use it against your doctor’s orders. Black and white peppers also give you numerous hair health benefits. 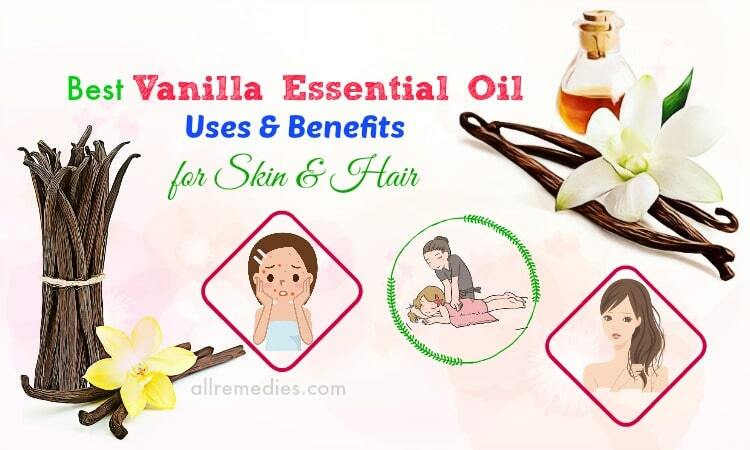 It can be a remedy for dandruff. Black pepper and white pepper help strengthen the hair root. Never use too much pepper on your scalp because this hot spice can cause discomfort and burn your scalp. Do this hair treatment twice a week to get a satisfactory result. There are numerous black and white pepper health benefits. However, overconsumption may result in unwanted side effects. It is important to take them in moderation. Here are several serious and not serious side effects caused by overconsumption of peppers. When you use black and white peppers to create treatments for skin and hair issues, you do not let pepper get into your eyes. It may lead to redness and a burning sensation in the skin and eyes. Stop using pepper directly on your skin if you have skin irritation and other symptoms like swelling, itching, and redness on your skin. However, these unwanted side effects are rare. You should limit consumption of black and white peppers during the hot summer months. This is because it can increase the body heat and cause bleeding noses. Both black and white peppers are available in a variety of forms, including ground pepper, whole peppercorns, or cracked pepper. Adulterated whole peppercorns are recommended buying. The selected pepper should be small, heavy, and free of blemishes. It is recommended purchasing the fresh white peppers in a reputed store for the high quality. Moreover, when buying black and white pepper in the market, you should choose the one with distinctive flavor. The whole black and white peppercorns should be chosen because of the optimum pepper health benefits. The whole black and white peppercorns are rich in essential nutrients and oils. Moreover, they keep flavor and freshness. 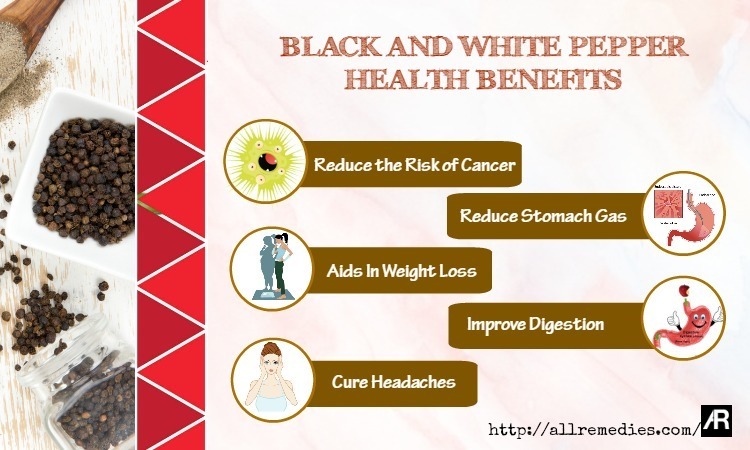 AllRemedies introduced to you 24 black and white pepper health benefits. Moreover, I also share the techniques for selecting and storing black and white pepper to keep their nutrients and distinctive flavor. Although there are numerous pepper health benefits, it is important for you to consume black and white pepper in moderation. Overconsumption can lead to unwanted health problems. I hope that you can find this article information and useful. If you have any questions to ask, leave them bellow. I will answer as soon as I can. Thank you for reading.